iSHSHIT: HyperMac Finds New Life! HyperMac is back with a vengeance! 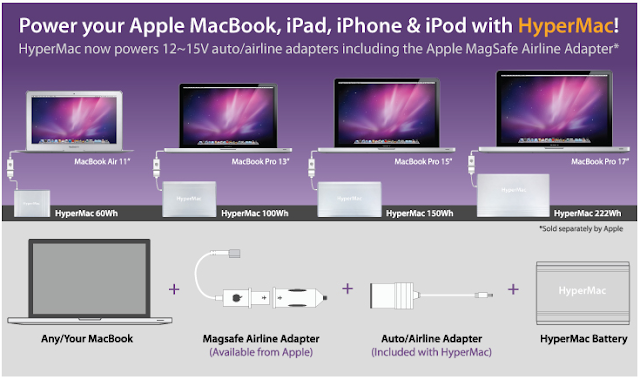 After Apple has forced them to stop the production of MagSafe adapters for their popular portible external batteries, HyperMac has been working hard for a new way to use its external battery packs on MacBooks legally and now we see the fruits of there labor... Now there is no way Apple can stop them (even though we usually side with Apple with these kinds of cases) we own a 100wh HyperMac and love it; being one of the best accessories we have ever purchased for our MacBook/iPhone/iPad and anything that can be charged with a USB cable. Now with there Auto/Airline adapter you will be able to use the HyperMac on a MacBook again!